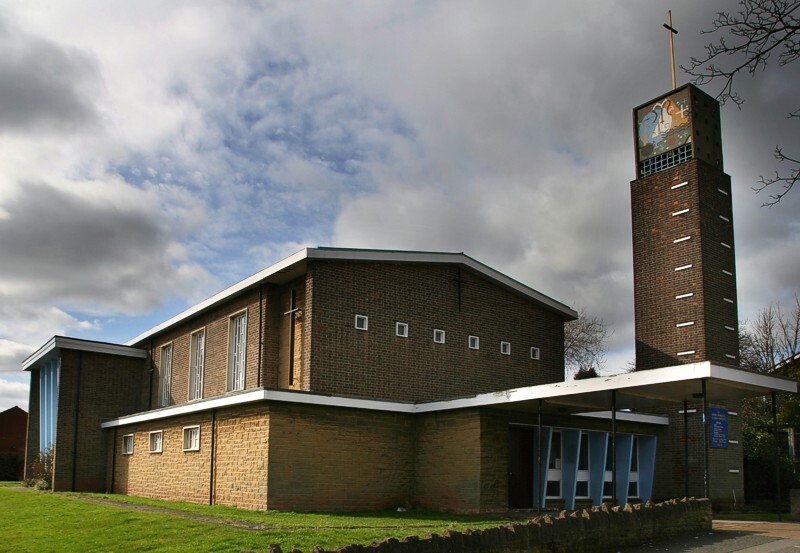 This modern brick church is the post-war successor to St John’s, Leenside, Nottingham, which was destroyed by enemy fire on 8th May 1941. One relic was salvaged: the altar cross which was made into a processional cross for the new church at Bilborough. Two ex-army wooden huts became the temporary church from March 1956. On 21st March 1959 the new church was consecrated. 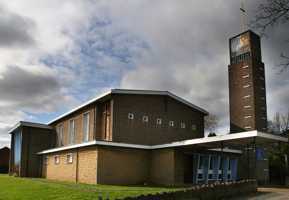 It was designed by Broadhead & Royle, architects, and stands at the junction of Graylands Road and Staverton Road. To make the best use of the site it was orientated with the altar at the west and main entrance at the east. The nave is a large rectangle (with north and south aisles) free of columns, the Lady Chapel separate behind the altar wall. There is a priest’s vestry and choir vestry, a north east tower, but no bell, and a transept. There is no east window, but plain rectangular ones all round. Rectangular pillars bear stations of the cross and there is a plain, flat baldachin. The stone tub font is tall and tapered, the wooden pulpit square and bearing nine apostles in stainless steel. There is a priest’s desk and one for readers. All the craftsmen who built the church are commemorated on a special wooden plaque. Outside roses hide five mosaic panels on the south transept wall.